Have you ever wondered what a fish ladder looks like underwater? From April to late June, 2017, Rutgers Professor Olaf Jensen and his research team were able to see that view through a streaming camera system at the Island Farm Weir fish ladder. Their goal was to help understand the impact of dams and weirs on spawning migrations of American Shad (Alosa sapidissima) and river herring (A. pseudoharengus and A. aestivalis). 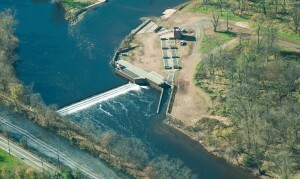 Since the removal of the Calco Dam in 2011, the Island Farm Weir in Bridgewater, NJ is the first obstacle diadromous fish encounter in their migration up the Raritan River. During the months it was active, a webpage (http://raritanfishcam.weebly.com) was set up to host the live stream. The site included a guide to the fish species that could be seen through the camera and shared information about ongoing fisheries research in the Raritan River. The installation of the camera system integrated the efforts of Rutgers scientists, staff, students, and local industry partners (New Jersey Water Supply Authority and New Jersey American Water Company). Through the Rutgers Raritan River Consortium minigrant program, the project was able to increase awareness and visibility of local fish species with hundreds of viewers on the Raritan Fish Cam webpage each day. It not only sparked excellent conversations with local anglers and educators, but it was also featured in the local newspaper, online angling forums, and at local events, including NOAA’s 2017 Ocean Fun Days. Additionally, it was used as an educational tool in classrooms in New Jersey, introducing local students to the many fish species that inhabit the Raritan river. Click on the Fish Cam image above to view Fish Cam Webpage and to learn more about the project or go to http://raritanfishcam.weebly.com/. Also read the article about the fish cam by Nick Polanin in Central Jersey.com entitled, Gardener State: Fish eye’s view of Raritan River.